Sorry, this entry is only available in Italian. For the sake of viewer convenience, the content is shown below in the alternative language. You may click the link to switch the active language. 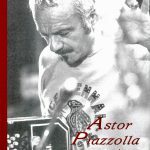 ASTOR PIAZZOLLA memorie – Natalio Gorin – Biografia Biografia ufficiale di Astor Piazzolla scritta da Natalio Gorin con prefazione di Aldo Pagani.